Here is yet another article supporting the idea that food affects our health!!!! Get on board and make healthy choices for your body and your mouth! 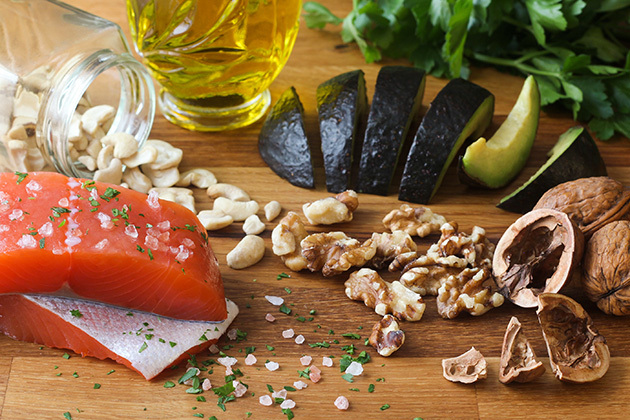 Salmon, cashews, walnuts, avocado and olive oil are all part of an anti-inflammatory diet. Everyone knows that diet is one of the biggest factors of healthy living. Doctors recommend dietary guidelines to patients to help combat widespread problems including obesity, heart disease and diabetes. However, recent research shows the right foods can even contribute to a decline in overall tooth loss. Researchers from many different universities came together to examine reports from the Centers for Disease Control and Prevention's National Health and Nutrition Examination Survey. This information showed the "inflammatory potential" of certain diets and led the team to believe a reduction in tooth loss could be associated with an anti-inflammatory diet. The study followed the diets of more than 6,500 participants to assess their Dietary Inflammation Index (DII) to determine a relation between eating habits and oral health — specifically, tooth loss. They found that on average the participants in the highest DII quarter lost 0.84 more teeth than subjects in the lowest DII quarter. Their results were published earlier this month in Clinical Nutrition Journal, in an article titled, "Diet-borne systemic inflammation is associated with prevalent tooth loss." Georgios Kotsakis, DDS, from the Department of Periodontics at the University of Washington School of Dentistry, further expounded upon the results. He explained that nutrients of certain foods had shown to elicit an inflamed tissue response associated with common inflammatory diseases like diabetes or periodontitis. "Participants were considered to follow a pro-inflammatory diet if their diet was particularly rich in carbohydrates, trans fat, or had overall high caloric intake," Kotsakis said. Kotsakis also explained the importance of following a diet high in anti-inflammatory foods — including omega-3s, fiber and vitamin D — to prevent developing an inflammatory condition. Even adjusting to an anti-inflammatory diet later in life is beneficial for people who want to avoid tooth loss. It's imperative that dentists open a dialogue with their patients about the comprehensive benefits of an anti-inflammatory diet. Oral health professionals unsure how to broach the topic or who do not feel qualified in this type of health are encouraged to partner with doctors and other medical specialists. Kotsakis advocated for a comprehensive approach to these nutrition tips. He even emphasized the possible benefit of addressing this issue with public health initiatives. "The addition of preventive oral health in the agenda for dietary public health interventions to prevent diabetes, obesity, and other inflammatory conditions has the potential to be a very cost-effective preventive strategy." Kotsakis said. Together, dentists and doctors can develop a good course of action to help patients transition to a healthier lifestyle. After all, most health-based dietary guidelines encourage the same behaviors: Drink more water, eat more vegetables and limit sugary treats. Encouraging patients to follow healthy diets works out in everyone's favor. Dentists can provide information to show how anti-inflammatory eating habits prevent unsightly and costly problems like tooth loss. Review best practices with those in your care to ensure your patients are smiling brightly for years to come.